Softened strawberry and vanilla ice cream is spooned into the crust in layers. 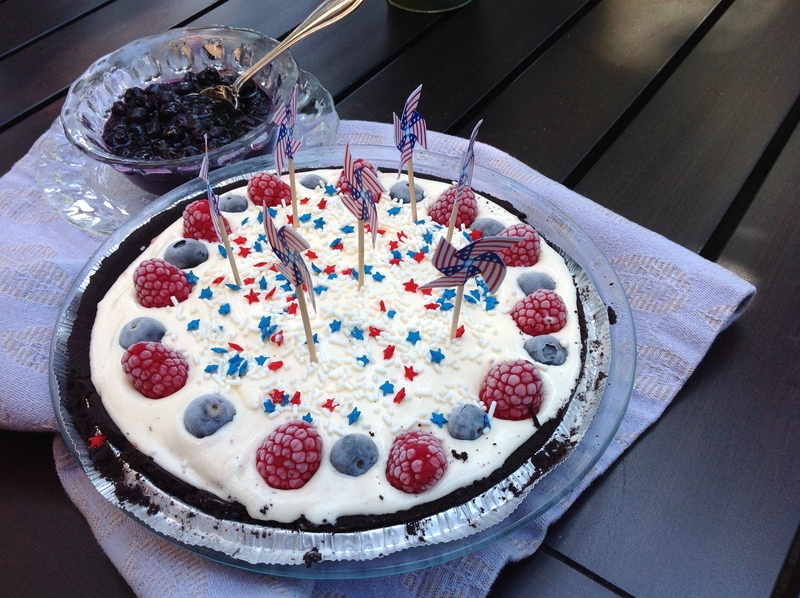 Then a simple decoration can be added by lining the outside of the pie with alternating raspberries and blueberries. Best of all, this can be prepared up to 2 weeks ahead, covered tightly, and frozen. Instead of a chocolate sauce warm blueberry compote is spooned over the pie slice just before serving. It’s a knockout Fourth of July dessert that will leave your guests asking for the recipe. It’s fun to stop by the party store and pick up Patriotic decorations that really make the pie stand out. This is so easy to make and can involve children as well. Kids can help decorate the finished frozen dessert. For other occasions you can vary the ice cream if you like. Just remember that the crust is either graham cracker or chocolate and go from there. A few of my favorite flavors include Cookie Dough, Oreo, Coffee, Salted Caramel and English Toffee. Make sure the ice cream is soft enough to work with but is not already melting; remove the ice cream from the freezer for 20 minutes before working with it. No matter what flavors you choose, you really can’t go wrong. So make time this summer to create your own signature ice cream pie. This is a great item to keep in your freezer. Remember to remove the pie from the freezer 15 minutes before serving for easy slicing; dip a knife in hot water for ease in cutting. Happy Fourth! Spoon ice cream into crust (if doing two different ice creams, spread one on top of the other); smooth top. Decorate the pie by alternating raspberries and blueberries around the outside rim. Freeze until firm. To make the sauce bring berries, water, and brown sugar to simmer in medium saucepan over medium-high heat. Cook until sauce thickens, stirring gently, about 4 minutes; remove from heat. To serve: remove pie from freezer 15 minutes before serving and decorate with Fourth of July sprinkles or other decorations. Cut pie into wedges; place on plates. Spoon warm sauce over and serve immediately.